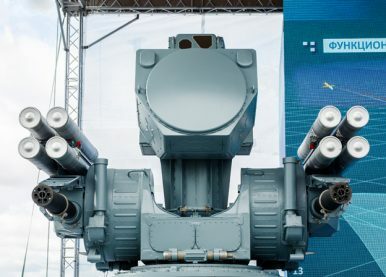 The Russian Navy’s flagship will get a new advanced short to medium range surface-to-air air defense system. The flagship of the Russian Navy, the aircraft carrier Admiral Kuznetsov, is slated to receive an advanced new air defense system during upcoming modernization work on Russia’s sole operational flattop, the Russian Navy Deputy Commander-in-Chief Vice Admiral Viktor Bursuk said on May 2. “Its air defenses will be improved and new shipborne Pantsir [surface-to-air missile] systems will be installed on it,” Bursuk said today, according to TASS news agency. “Besides, its power-generating equipment will be replaced by new boilers, a number of new pumps and new flight control systems: landing, surveillance, control systems and so on.” Given the ongoing global arms race for advanced anti-ship missiles, installing the Pantsir-M/EM air defense system aboard the Admiral Kuznetsov is unsurprising. All Soviet carriers were constructed in Ukraine and Russia has lost valuable expertise and technology — particularly surface ship propulsion technology — due to the ongoing crisis in Ukraine. While Russia did overhaul a Kiev-class carrier-cruiser for the Indian Navy converting it from a hybrid carrier/cruiser to a pure carrier in recent years, the project encountered multi-year delays and cost overruns with India having to pay $1.2 billion more than originally budgeted. The carrier, commissioned in 1990 and capable of carrying of up to 41 aircraft including Su-33 air superiority fighters, MiG-29K/KUB fighter aircraft, as well as Kamov Ka-27, Ka-31, and Ka-52K helicopters, has not undergone a major retrofitting since its commissioning, except for a two-year refit between 1996 and 1998 supported by Ukrainian expertise and hardware.